London Drugs tallies an important metric in 2018: one million pounds of plastic recycled. Plastic bag use by customers also dropped 75 per cent over two-year period. Thanks to you and to robust recycling processes and partners, together we diverted 12 million pounds of waste from landfills in 2018, including one-million pounds of plastic recycled. Customers are more mindful now than ever about their plastic bag use, with a 75 per cent reduction in plastic bags being used in our stores compared to bag use totals from 2016. “Our updated plastic, cardboard, Styrofoam, and additional material recycling statistics is a culmination of several initiatives London Drugs has undertaken in our stores, head office and distribution centre and just as important is a nod to our customers for bringing in these materials for proper recycling instead of throwing them in the garbage and having them end up in our landfills,” says Raman Johal, London Drugs Retail Operations Sustainability Specialist. We accept recycling in all of our London Drugs locations across Western Canada and we have Recycling Centres in 39 stores, making it convenient for customers to recycle everything from batteries to styrofoam, small appliances, and more. In 2018, London Drugs achieved an average 93.5 per cent waste diversion in its stores. 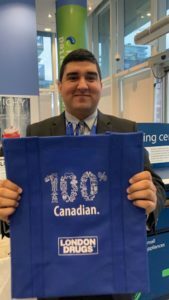 Since initiating new plastic bag reduction measures, London Drugs saw plastic bag use by customers decrease by 75.1 per cent since 2016. Through this continued commitment to recycling, plastic and waste reduction, a young customer has come forward with similar environmental goals who is going to great lengths to promote plastic reduction. Mason is an eleven-year-old Lower Mainland boy and the creator of Mason’s Ocean. Mason has been using social media to share important information about the oceans and how everyday recycling actions can significantly reduce our impact on the environment. 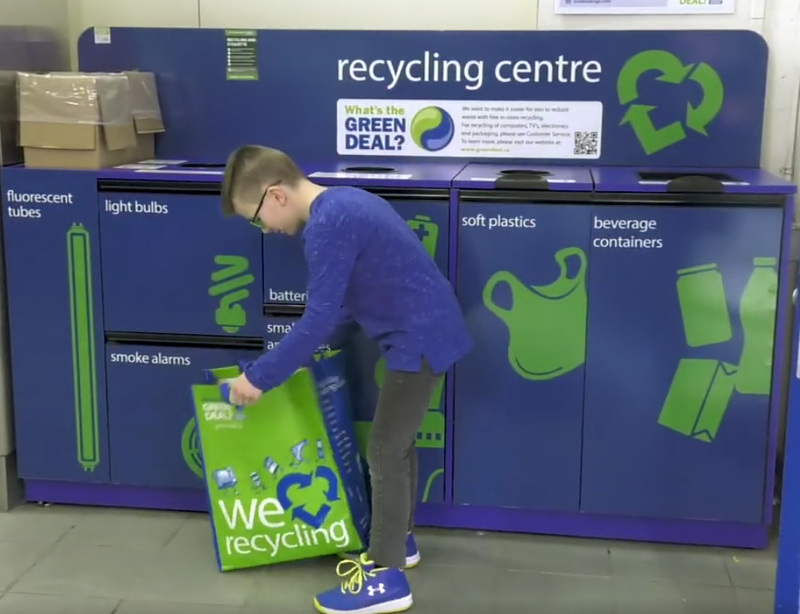 Mason and his mother regularly use the London Drugs recycling centre to responsibly reduce waste. “London Drugs is a company that is leading by example by providing easy and accessible recycling bins to help reduce the amount of plastic that ends up in the landfills and oceans,” says Mason, founder of Mason’s Ocean. Learn more about London Drugs’ recycling efforts and what we take back. Mason is only in grade 5, but he is already having a big impact on the planet with his passionate website and social media project called Mason’s Ocean. He (and his mom) are also committed London Drugs recyclers. As a BC-based company, London Drugs is passionate about reducing waste to help benefit our oceans and all the communities we serve. For Earth Month, the London Drugs What’s the Green Deal video team travelled to the Vancouver Aquarium to help Mason share his story. “When I was eight years old and I watched the film Sharkwater, it was then that I realized I had to start helping the ocean,” Mason says. He posts frequently on his Mason’s Ocean Facebook page and Instagram feed with interesting ocean and animal facts and tips on how people can make a difference with their own actions. We see how Mason puts his heart into saving the world’s oceans, while dealing with a little heart trouble of his own. In 2018, 11-year-old Mason faced a challenge when he and his family discovered he had a heart condition — a narrowing of the aorta. He underwent heart surgery at BC Children’s Hospital and returned stronger than ever. Lately, Mason has become more focused on the issue of ocean plastic and helping his family to reduce their waste. He visits the Vancouver Aquarium (an Ocean Wise initiative) and stays on top of the issues through its Plastic Wise program. Mason shares the importance of recycling against a backdrop of spectacular marine environments and amazing ocean plastic education exhibits – including Douglas Copeland’s stunning ‘Vortex’ display. Mason and his mom combine their waste recycling with household shopping trips to London Drugs. From plastic bags to batteries, light bulbs and more, it’s a convenient way to responsibly reduce waste. It also marks a real point of difference in the retail industry. Mason’s mom, Shanna, appreciates the service. In 2018, London Drugs and its customers diverted over 11,000,000 lbs of materials from landfill. It’s all part of our commitment to a more sustainable retail future. Mason’s future plans include getting a PhD in marine biology and maybe studying environmental law. “I want to change the laws in favour of the oceans,” he says. We can’t wait to see what you accomplish, Mason – you are the REAL Green Deal. Your local London Drugs takes batteries, electronics, small appliances, soft plastics, Styrofoam, and more. 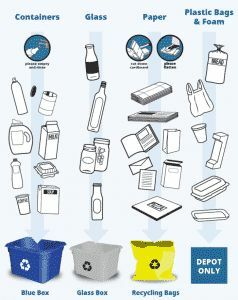 For the complete list of what you can recycle, visit http://www.greendeal.ca/recycling. You can follow Mason’s journey on his Facebook and his Instagram channels. You can recycle a lot of things at London Drugs, from batteries to small appliances to smoke alarms. But just in case you sometimes ask yourself WHY you bother recycling, here’s a look at five things we take back that really should never be thrown away and the most important reasons for that. It’s tempting when cleaning out the closets to just chuck that old doorstop of a computer into the alley or dumpster. (Maybe SOMEBODY will want it?) Well, somebody might — and they may have less than noble plans for your data. It’s very hard to completely erase digital memory, so data-carrying devices may have personal information on them that can be retrieved. That’s why London Drugs’ computer recycling takes extreme care to track data-carrying devices and destroy the hard drives before they leave our stores. Our recycling partners also have security measures and ALL of our electronics are broken down into materials here in Canada before being shipped anywhere else. Got an old computer, PDA, or cellphone? Recycle them with us. Besides stored electrons, batteries also contain complex compounds that can be harmful to the environment. Fortunately, many of these materials are also valuable enough to recover for use in remanufacturing. Lithium, iron, nickel, manganese, copper, and zinc are some of the elements that are recovered from battery recycling. These are not good to have in our landfills or waterways. So drop your batteries off at London Drugs (here’s what will happen to them). We take rechargeables, alkalines, button batteries, and specialty electronics batteries (under 5 lbs). According to one study, one gram of mercury can contaminate a 20-acre lake. Many fluorescent-type light bulbs contain traces of mercury, so it’s a good idea to keep them out of our ecosystems. We take compact fluorescents (CLFs), LEDs, even Christmas lights and fluorescent tubes up to 48”. Just be sure to avoid bulb breakage while recycling. Seal the bulbs in a zip bag and put them in a box. Styrofoam, or ‘Expanded Polystyrene’, is actually a very recyclable material. Our recycler partners take the air out of it, condensing the foam down until it is virtually solid plastic. Then it is sold on commodities markets to be remanufactured into picture frames, mouldings, and more. It may come as a surprise, but even though a lot of us know the importance of recycling (especially amidst growing concerns for the health of our planet), not all Canadians are aware of what can be recycled. A whopping 91% of plastic isn’t recycled (whoa!) and each year about 8 million metric tons of plastic is thrown into the ocean. An annual awareness campaign, Zero Waste Week, reported that more than 120 billion units of packaging are produced every year by the global cosmetics industry. Our beauty routines affect the environment, and that’s why we want to find ways to support us all in becoming more conscious of what we do with items like our empty shampoo bottles and hairspray cans. Let’s face it—recycling beauty products can feel like a daunting task. With so many different materials in packaging, sometimes it’s hard to know whether it’s recyclable or destined for the trash. So, we’ve laid it all out for you to make the process smoother. Local rules: It’s important to look into your local recycling rules, as every city has varying restrictions. Your local government website is a great place to start. Recycling logo: The recycling logo is a good indicator that an item is recyclable. Lather, rinse, repeat: Yes, you do have to rinse out bottles before you recycle them! Cardboard: Cardboard is a very common form of packaging for cosmetics. You can easily break down the boxes your products came in and place them in the recycling bin. Plastic: Your empty shampoos, conditioners, cleansers, and moisturizers don’t belong in the trash! 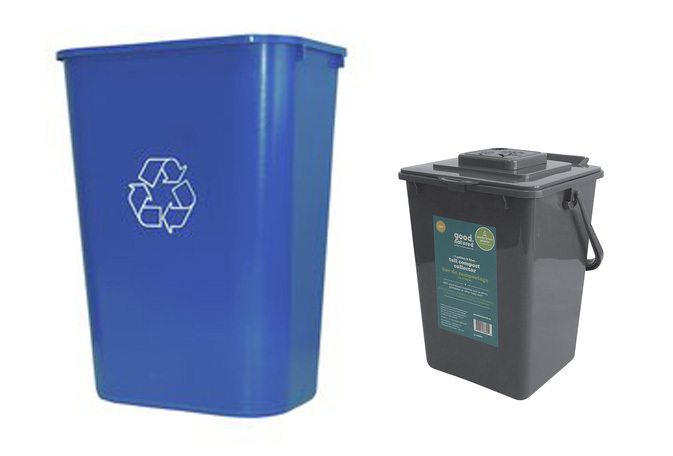 These plastic containers can often be recycled alongside your other plastics. Don’t forget to include the lids! Glass: Rinse your empty bottles and toss them in the recycling bin with your other glass items. Pumps: Pumps can be tricky as they often contain multiple materials (a metal spring and cap for example). Just remove the metal spring and place the cap back on the bottle before you toss it in the appropriate recycling bin. Unfortunately, we can’t accept glass, lipstick tubes, or nail polish containers at this time. The recycling industry is still working on how to recycle small items like this. As most of the facilities use automated machines, small items like lipstick tubes are often missed and end up back in the landfill. We’re working toward a goal of recycling everything we sell one day. Thanks for working with us to get there! We’re here to make it easy for you to feel good about consuming your favourite beauty products conscientiously. Upcycler and crafter extraordinaire Denise Corcoran (Thrifty By Design) has a passion for turning ‘junk’ into new and funky pieces. From refinishing furniture to repurposing discarded items like wine corks into jewellery, she believes there is no limit to what a bit of time and know-how can create and save from the landfill. Here Denise shares 5 of her favourite upcycled crafts. Do you ever look in your recycle bin and think you could make crafty magic happen with your recyclables? I do. All the time! So many items you find in your recycle bin can be repurposed into fun rainy day projects. From mason jars (which you can find at London Drugs!) to cereal boxes to tin cans… there are simple DIYs that turn used objects into treasure. And the bonus for all of us is that you help keep these objects out of the landfill. Here are a few easy upcycled crafts to get you started! Mason jars are super trendy when it comes to upcycling. One easy project is to refashion the mason jar into a lantern. By decoupaging tissue paper on the outside then adding a tea light in the mason jar, you’ve crafted an easy lantern. You can even step it up a notch by taking a Sharpie and adding a face or design to the decoupage. Step 1: Grab some mason jars of various sizes and ensure they are clean. Step 2: Tear up pieces of tissue paper. Either use one colour or try mixing it up with various colours. Step 3: Add a coat of Mod Podge or liquid white glue to the mason jar. Step 4: Add pieces of tissue paper to the glued area. Then coat the tissue paper with more Mod Podge to smooth out the paper and seal it. Step 5: Continue step 3 and 4 until the mason jar is completely covered with tissue paper. Allow to dry. Step 6: Insert a regular or LED tea light into the mason jar to create a lantern. One of my favourite go-to items from my recycle bin is cereal boxes. They’re perfect for DIY stationery, art, gift boxes, or gift tags. They’re also perfect for your office to organize your papers, magazines, or mail. It doesn’t take much to turn an empty box into a swanky organizer for your kitchen or office. Step 1: You can use any size of cereal box to create your DIY office organizer. Step 2: Measure and mark where you want to trim the cereal box. Step 3: Use scissors or an X-acto knife to trim the box. Step 4: Cover the cereal box in old wrapping paper using a glue stick or Mod Podge. Step 5 (optional): Jazz up your organizer with ribbon or funky tape trim to add a bit more pizzazz. Step 6: Upcycle more boxes to create a set of organizers. There are some super fun DIYs out there when it comes to upcycling wine corks. You can turn wine corks into a boat, fridge magnets, or even repurpose them into jewelry. So many possibilities! On a cold day why not stay in, make wine cork stamps, then use them to decorate handwritten notes or to create your own stationery. Just be careful when creating your stamps since you’ll need an X-Acto knife. Step 1: Find wine corks with dense cork to use for your stamps. With a pen, outline your stamp design. Also add a line about a 1/4 inch along the wine cork. Step 2: Cut your design out using an X-Acto knife. Cut into your design and then into the line along the side of the wine cork. This will remove the cork to create your stamp. Step 3: Keep cutting until you’ve fully exposed your design. Step 4: Start stamping! You can use an ink pad or acrylic paint to create your design for DIY cards, gift tags, etc. Depending on the size of the tin cans you have on hand, you can refashion them into a pencil holder, a planter, or maybe even a cute robot. I love turning a boring tin can into a musical instrument. All you need is rice and beans for the inside of the can, and a balloon and duct tape for the top. It’s that easy to take your junk and make some funk. One of my top go-to craft materials is duct tape. You can get patterned duct tape that is an easy way to jazz up your shaker. Step 1: Grab a tin can from your recycle bin. You can use any size for your DIY shaker. Step 2: Fill it with rice, dried beans, or anything else that will be good for making music. You don’t need much — maybe 3-4 tablespoons. Step 3: Cut the opening of your balloon. You want to remove this since you’ll be stretching the balloon over the opening of the tin can. Step 4: Stretch the balloon over the opening of the tin can. Ensure it’s tight and that the balloon stretches down the tin can. Step 5: Cover the tin can with funky duct tape. This ensures the balloon stays in place plus adds some funk to your shaker. Feel free to add other embellishments. You can take an old CD and make gold with it. CDs can be cute animals, coasters, or even art. You can even upcycle the CD case into a frame for your art! A cool but messy DIY would be to cut up old CDs and create a mosaic. You can dress up an old frame or table using repurposed CDs, adhesive, and craft paint. I use white craft paint to mimic grout around the pieces of CD. Step 1: Take an old frame or score one from a thrift store that has a flat surface. Step 2: Gather your supplies — a pair of scissors, old CDs, and some adhesive. Step 3: Cut up your old CDs. This can be a bit messy so be prepared. Cut the CDs into a variety of sizes. Step 4: Add glue to the surface of the frame then add your pieces of CD. Step 5: Keep adding pieces until the frame is covered. Step 6: Cover the frame with white acrylic paint. Allow to dry. Rub or scratch the CD pieces to remove the white paint. Then you’re done. Based in North Vancouver, B.C., Denise Corcoran is the author is Raw Crafts: 40 Projects from Hemp, Jute, Burlap and Cork. Sharing her enthusiasm for crafting and upcycling, Denise facilitates ‘Crafternoons’ throughout Vancouver where participants of all ages and skill levels learn how to make things from unorthodox materials. She was a featured panelist at the Craft Council of BC talk called ‘Craft, The Environment & Our Community’. She was also the inaugural BC Champion for the fourth annual Culture Days, a national, nonprofit 3-day event promoting culture throughout Canada. Denise is also a Creative Expert for the Salvation Army Thrift Store, sharing thrifting tips and simple upcycling DIYs. The holidays are a magical time, but they can also be a time of great waste; piles of wrapping paper, product packaging, old products, and electronics all end up in landfills around this time of year. We talked to two of our London Drugs experts on holiday waste reduction and recycling to share some strategies on how to keep the season green. What can people keep in mind while they’re shopping to avoid unnecessary holiday waste? How can shopping at London Drugs for the holidays help keep waste out of landfills? Chris Odgaard: “London Drugs is always working to be a green leader in sustainable business practices. We offer a ‘buy online, pick up in store service’, which means that many hundreds of items are shipped to a store on a single truck, reducing transportation waste. And if you’re shopping for service gifts, London Drugs offers a variety of services such as computer servicing and repair, audio-video home services and setup, and digital photo scanning, which can all be purchased with a London Drugs gift card. Do you have any other green tips for holiday shoppers? Thanks to our experts for the great advice! If you’re looking for more tips on how to reduce your waste around the holidays, or any other time of year, explore our Green Deal page. Happy gifting!